Richly detailed yet charmingly cartoony illustrations of various kinds of utility trucks, with explanations of their purposes. I think this book must be Jimmy's favorite. He tries to check it out almost every time we go to the library, and never wants to return it. He especially enjoys it when his Daddy reads to him about all of the different growly sounds the trucks make.This book makes an excellent exploration of different kinds of trucks. In addition to some funky truck faces and enjoyable rhymes, it also has a section in the back that provides information about each truck: the weight, capacity, and special features at a minimum, and sometmes the length or lift capacity, or whatever other interesting fact is needed. There are 12 trucks covered: a dump truck, garbage truck, milk tanker truck, bulldozer, snowplow roller truck, fire (ladder) truck, sweeper, tow truck, concrete mixer, semitrailer truck, and digger/excavator. It was especially neat to see the snowplow and sweeper, which don't get as much coverage in the various truck books we have read.The rhyme and repetition here make this a great book to read to your kids. Students around the ages of 2-8 will probably enjoy this book the most, but quite honestly, I think it is a fun read for all ages. This book is a monster size board book about all kinds of monster trucks. With its brightly colored illustrations and short verses full of rhyme and humor, its a must-have for all students.This would be great to engage young boys into reading. Furthermore, it has brightly colored trucks with funny faces, that kids find funny.This could be great to help kids understand poetry, rhyme, and descriptive language. They could use the book and follow a similar format using different concepts or themes. My two-year-old nephew would probably rate this as five stars if he understood what I was talking about. In the last 24 hours I have read this book to him more than a dozen times. It only doesn't rate five stars for me because some of the rhymes don't scan right, but the trucks are certainly child-tested and fascinating. He also has fun turning the over-size board book pages and identifying some of the large letters used on the trucks' names (like "Mr. Salty" for the snow plow or "Doug" for the digger). I like that this book covers all the major trucks but in a way that is different from every other truck book we have looked at. This book uses rhyme, onomatopoeia and facts to teach about the major monster trucks like snow plows, diggers, milk trucks, etc. I would give the book as a gift to other little boys that love trucks. A fun little rhyming story about all the different types of big work trucks. You have to use a growly, monster voice when you read it out loud.The illustrations are okay. Nothing really unique or special. MONSTER TRUCKS! 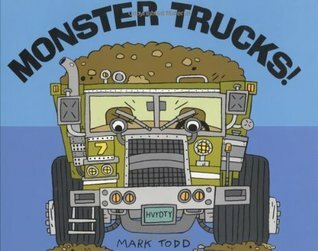 by Mark Todd is a perfect rhyming picture book for the truck enthusiast. It makes a great read-aloud! It includes back matter of facts on the 14 different types of trucks featured in the book. It includes information such as speed, weight, lift capacity, special features, etc. Great illustrations. The chant rhythm is nice, but the book feels just a few pages too long. But that might just be for me - probably great for a kid really interested in trucks. Oversized board book format was very appropriate. I love it it's really cool and cause I love monster trucks. My son is 2 and he loves reading this book together first thing in the morning and last thing at night. Great book for any kid who loves trucks! There are very cute rhythms in this book. It was fun to read and has nice details in the pictures. This board book would be exciting for any truck-loving child age 4 and younger. Read to this William when he was very young and had some interest in cars and truck as he learned to identify them. Nothing outstanding about it. My 5 year old enjoyed it being read to him a few times. Alex really likes this book and it is one that he grabs often for our late-evening read-athons where he and I both read our respective books while chilling out in his room before bed. 2* art2* rhymeA great selection of trucks. I keep stumbling over the lines, though, the rhythm isn't quite right.